Looks like Takeoff from the Migos was prevented from doing just that on Friday. Like our fearless leader Danielle Belton, it seems that a Delta flight attendant did not recognize the bubblin’ rap trio and therefore didn’t know that this would be bad bad bad (and so not boujee) for Delta’s publicity. TMZ reports that before the flight, heading from Atlanta to Des Moines, Iowa, left the ground, a flight attendant approached Takeoff, Quavo and Offset and asked Takeoff to move his book bag from the aisle. After Takeoff was put off, Offset, Quavo and their manager also got off the plane, but their story was a little different. Migos said that Takeoff didn’t move his book bag out of the aisle because he was asleep. In video posted by TMZ, the manager is heard telling a Delta crew member that they were going to sue because the group did nothing wrong. He also said that they were being racially profiled—imagine that! Delta must have agreed because the Migos made that Iowa concert on time—apparently on an “entire plane” just for them. 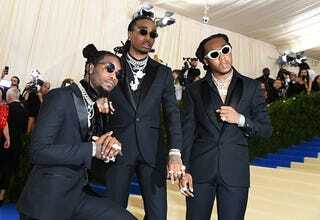 Migos (their manager?) took to IG to mumble a little rap about the resolution.